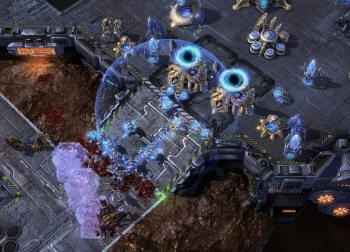 I’m a big fan of a good RTS game, but I never dove into the original StarCraft. The reasoning is simple; I picked up the genre after the original game’s heyday. I began playing RTS titles with Age of Empires II: Age of Kings late in AOE2’s life cycle. I honestly never made much of an attempt to go back to the older RTS games that I’d missed (aside from the original Warcraft, which I had bought before getting hooked on the genre). The sum of this rant is that I pretty much was stepping in to StarCraft II blind as to it’s play mechanics. The result has me left me impressed, surprised, and most importantly, hooked. SC2’s campaign has an nice old-school adventure game feel to it’s between-battle menus that have you clicking on different objects in rooms to illicit different reactions and interactions. The battles themselves are diverse and creative. But it’s just a side-dish to the head-to-head multiplayer matches. It was here that this review ran into a snag. I may enjoy RTSs, but I’m not good at them. I play them at a slower pace then the average gamer and am no match for anyone with a n aggressive streak. To that end, my competitive play had to take place in a more controlled environment versus A.I. and with my pal Omegasim. Omega is about on my skill level, so we’re a good match. Unfortunately, he didn’t have a copy of SC2 to play against me with, so it was going to be one of us against the A.I.. Not a good substitute for head-to-head play, but that’s what we had to work with. Here the review hit a snag again. I’d played through the tutorials and ran a handful of games against the A.I. to get brushed up and learn some from some of my mistakes (the post-match build order list is a godsend for learning from better players/the A.I.). I played for a while, and came away with some results that I’ll get to in a minute. It was then Omega’s turn, so I left him with the computer for a time. I came back to find his units sprawled across the map, taking over everything in sight. However, he couldn’t find his enemy. We quit that match and found out that he didn’t have an enemy; he’d forgotten to add an A.I. opponent to his match. That alone is an oversight by Blizzard in my mind. You should not be allowed to enter a single player skirmish without an A.I. to battle. As to my take away from my play time, I really enjoyed the unit balance and the different races’ play styles. 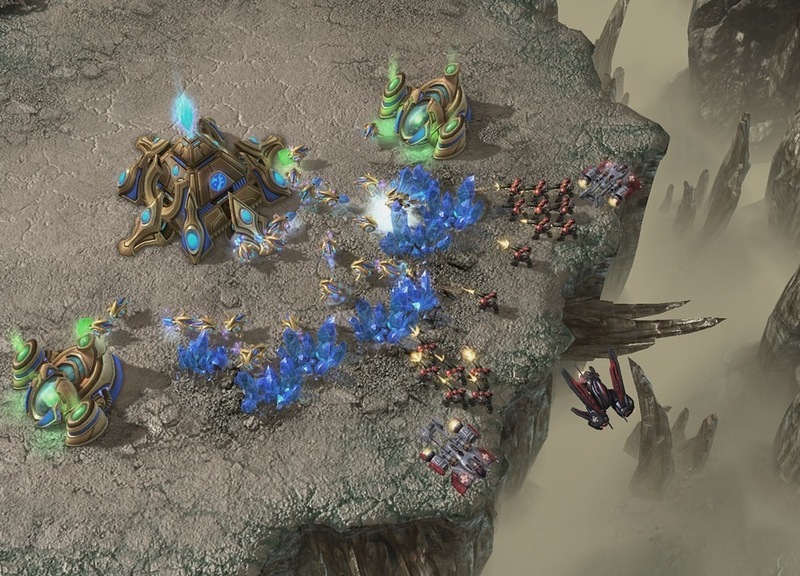 From evolving the Zerg larvae into more advanced units to summoning Protoss buildings to the conventional RTS style of the Terran forces it forces you to change your style depending on who you play. Combat is eased – for me – with the inclusion of a visible bar to organize and manage your control groups. The default ‘fast’ speed can be overwhelming at first but after a while was the only speed I wanted to play at. Visually the game us gorgeous. The cut scenes in the campaign are really well done and the in-game graphics are stunning. Sound-wise, the units weren’t as obnoxious to click on as some games I’ve played (and, in Blizzard tradition, take exception to over clicking). The music I could take or leave, though. In the end, even though my head-to-head experience didn’t go as planned, StarCraft II is still one of the best RTS games I’ve ever played. Alphasim out.